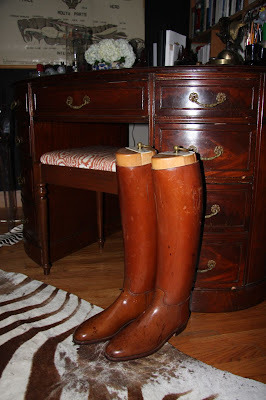 One very kind New Yorker is moving South and needed to sell this beautiful pair of riding boots from Peal & Co. She found me - and I desperately bit. The original owner, Captain H.W. 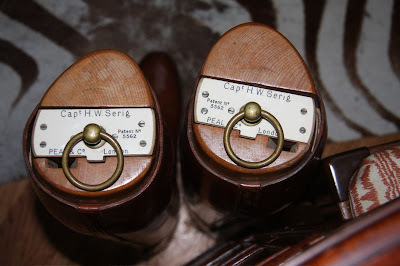 Serig, must have also liked the look of them sitting in his home, because they've barely been worn. Or maybe it was just too hot for tall boots in Hawaii. Old records show that in 1936, a Captain H.W. Serig was appointed Officer-in-Charge of the just formed Radio Repair Section at the Hawaiian Air Depot (see page 11 of this memo), where military planes - and radios - were fully dismantled, repaired and reassembled. Oh those are wonderful! Very nice find indeed! Gorgeous boots! But I also like the desk in the background - can you please provide some more pics of that desk? it is too hot to wear anything in hawaii always. sadly! otherwise i'd be all about riding boots aw well. sharp! Found your blog through Cherry's and I am enchanted and delighted. Boni de Castellane, as to the desk...it belonged to my grandmother and was in our house growing up. It had to be completely refinished after spending years in an old garage. It's got a beautiful leather top and I always loved the oval shape! Thank you for the reply Hollister. The fact that is is inherited makes it even better - this desk simply is a stunning piece of furniture. Congratulations! If you ever happen to take some more pictures of it - let me know. they're so beautiful! i LOVE the back story. May I ask apx how much they cost? I've been trying to find estimates before I buy but haven't been able to find much information. Thanks and GREAT little story to go with the boot forms!